Go into a fish store and you’ll most likely be met with a wide selection of nano and desktop aquariums. While there are certainly times where these small tanks are a perfect fit for your needs, they are not without their problems and challenges. And perhaps the biggest challenge is what to put in it. Most fish are simply too large. Fortunately, there is an ideal choice. Dwarf freshwater shrimp are not only the perfect inhabitant of a nano tank, they are also full of charm and, given proper care, quite hardy. What Freshwater Shrimp Should I Get? As with stocking any aquarium, when you’re looking to start up a shrimp tank, you need to start out by deciding what shrimp you want to put in it. There is a pretty wide variety of shrimp available, but the most popular largely fall into one of a few different types. 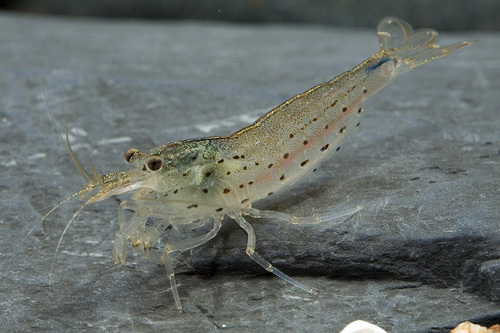 The most beginner friendly fish are the various varieties of Neocaridina heteropoda. By far the most popular is the Red Cherry Shrimp, but this group also includes the various Rili Shrimps, Blackberry Shrimp, and Yellow Shrimp. What is the difference between all of these? Nothing more than their color, and there is an enormous variety of N. heteropoda to choose from. What makes Red Cherry Shrimp so well suited for novice keepers is that they are able to survive in a wide range of conditions. As long as you can keep your water chemistry stable and your nitrates low, your shrimp should thrive. Neutral pH (7.0) is just fine for them, but they’ve been known to survive from almost 6.0 to 8.0. Standard aquarium temperatures are also suitable with anywhere in the 70’s relatively safe. 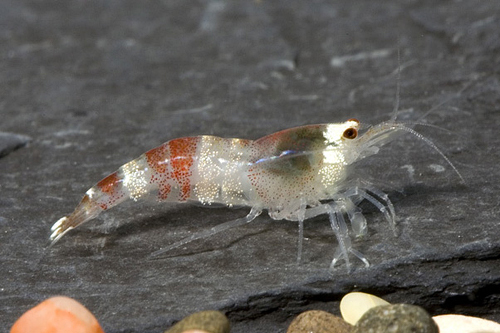 Red Cherry Shrimp are among the smallest shrimp, only reaching around an inch in length. They also contribute a very small amount to your tank’s bioload, meaning you can keep a decent number of them in even a small tank. They love having a moderate amount of plants they can hide among and will help eat stray algae or dead plant matter. Like the Red Cherry Shrimp varieties, Caridina cantonensis can be found in a huge number of varieties, including Crystal Red, Bee, King Kong, and Tiger Shrimp. Even within those that are called Crystal Red Shrimp, there is a surprising range of “grades” that showcase distinct traits. Among serious shrimp keepers, the higher grade Crystal Reds can be highly sought after, often with a price tag to match. 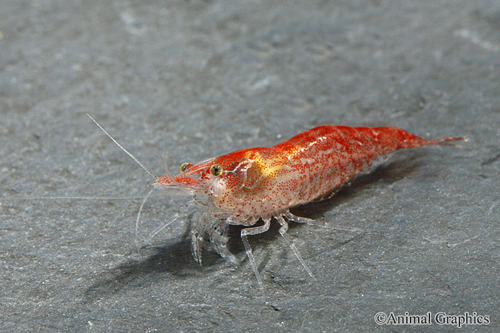 Crystal Red Shrimp are often seen as being a “step up” from Red Cherry Shrimp because they are a little more sensitive to water conditions. While they still need a lot of stability in their tanks, they cannot handle the range of chemistry that Red Cherries can. Crystal Reds need to be kept in relatively soft, slightly acidic water. They also prefer slightly cooler temperatures, with mid to high 60’s being ideal. If you can provide these considerations, there are few other differences when it comes to setting up your tank or feeding them. They do get slightly larger, growing to around an inch and a half, meaning you can’t put quite as many into an aquarium. But they still contribute a relatively small amount to your bioload. Japanese Algae Eating Shrimp are renowned for their appetite for algae and are often the top choice for planted aquarists. Their translucent grey/brown color is not nearly as eye catching as the bright colors of Red Cherry and Crystal Red Shrimp, but their benefits more than make up for that. Japanese Algae Eating Shrimp love densely planted aquariums that provide them an abundance of natural foods and plenty of places to perch. Caring for Amano shrimp is relatively straightforward as well. They thrive in neutral to slightly alkaline water (pH 7 to 7.5), which matches many aquariums’ natural conditions. They also do well when their temperature is kept in the mid 70s, which is also in line with how many aquariums are kept. 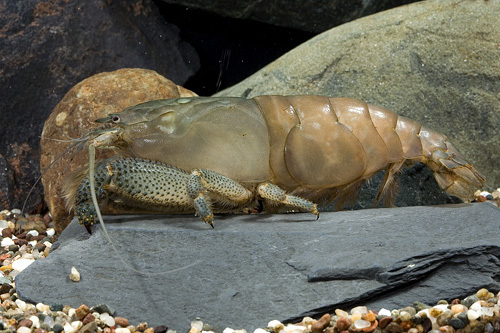 Vampire Shrimp are a little different from any other shrimp on this list in that not only do they grow a bit larger (often around three inches, though some have claimed they reach close to six), but they are also filter feeders. Vampire Shrimp love being able to sit atop a piece of driftwood in an area with a decent amount of current, catching particles of food as they come floating by. In terms of water conditions, Vampire Shrimp prefer their water to be a little bit alkaline, though they can survive in water ranging from 6.5 to 7.5. They also like it just a little bit warmer than the other species, with temperatures in the upper 70’s, or even around 80. Depending on your aquarium, feeding Vampire Shrimp can either be incredibly easy or take a little more care. In a larger aquarium, there is likely to be enough naturally occurring food floating through the tank that you won’t need to worry about feeding them. In smaller tanks, though, you need to ensure you give them finely powdered food, floating in the current. You should never see your Vampire Shrimp actively searching the aquarium for something to eat. It should go without saying, but success with shrimp starts with the water they’re kept in. Compared to fish, there are several substances that shrimp are highly sensitive to that you need to take care to avoid. While you want to keep your nitrogenous waste (aka ammonia, nitrite, and nitrate) low in all aquariums, it is especially vital in shrimp tanks. All shrimp are highly sensitive to these pollutants. This means you should ensure that your tank is well cycled before you add your shrimp. Additionally, you need to be diligent in performing water changes to keep your nitrates low. Keeping plants in your aquarium is also a great method to reduce your nitrates (though you still need to perform water changes to eliminate other pollutants). Shrimp are also highly sensitive to heavy metals and a number of chemical compounds. This comes into consideration most often when looking at medications. Most aquarium medicine contains copper or other substances that are lethal to invertebrates, even in low doses. Do everything you can to avoid medicating a shrimp tank. Because they are so small, shrimp can be kept in almost any type of aquarium available on the market. For the many nano and desktop tanks out there, shrimp are often a better choice than any fish. In fact, it could be argued that shrimp are one of the few aquatic animals you can keep that don’t benefit from going above a certain size. That being said, there is always a benefit to not trying to keep them in the smallest tank you can find. Having a larger volume of water makes everything more stable, and stability is one of the keys to success with shrimp. Unless you are very experienced and confident in being able to provide meticulous care, think about sticking with aquariums 10 gallons or larger. 20 gallon long aquariums are a great choice for a sizeable colony of shrimp. Shrimp will swim on occasion, but most of the time you’ll find them staying on the bottom of the aquarium. As such, maximizing the footprint of your aquarium is better than choosing a taller tank. What Substrate Should You Use? When trying to decide on a substrate for your shrimp tank, there are only a few considerations to make. Otherwise, it’s another area that shrimp are very undemanding about. Depending on your local water supply and the exact species of shrimp you want to keep, you may want to choose a substrate that will help you maintain the ideal water chemistry. Some substrates will naturally buffer your pH higher or lower, or may help with making your water a little harder or softer. Choosing too large of a substrate (such as river rocks) could create large empty spaces that shrimp are likely to crawl into, making it harder to view them. This may not be a bad thing in terms of helping them thrive (and may in fact help protect baby shrimp as they grow), but it would take away some of the aesthetic appeal of your aquarium. Additionally, plants generally don’t grow terribly well on this type of bottom and the benefits of plants cannot be overstated. Speaking of plants and substrate, there are a number of substrates that are designed specifically to support plant growth. These can work amazingly well for shrimp, but be aware that there is the possibility that under the right (or wrong?) conditions they can release nutrients into the water. This is a side effect to how they store the nutrients to help the plants grow, but can be dangerous for the shrimp. Again, not all substrates will do this, but make sure to test your water regularly so you can ensure it’s safe for your shrimp. Then again, you’re already doing that, right? Most other aquarium substrates such as sand or aquarium gravel should pose no problems for your shrimp. In order to maintain pristine water, you want a great filter on your tank. But filters can pose another danger to shrimp. Small shrimp, such as babies and juveniles, can relatively easily get sucked into a filter intake. In order to protect your shrimp from this, you want to make sure that there are no holes large enough for even baby shrimp to fit through. Many people recommend sponge filter for shrimp tanks. Similarly, foam covers can be fit over the intakes of hang on back and canister filters to prevent untimely shrimp demise. You can also use a fine mesh or screen to cover overflows if you are using something like a sump tank. If you are keeping Vampire Shrimp, make sure that you either have a filter that creates a decent current or add a supplemental powerhead to your tank. Picking out the perfect shrimp tankmate can create a number of challenges. In almost every ecosystem they live in, shrimp are the bottom of the food chain. Almost every fish will see your shrimp as a potential snack. However, that’s not to say that you can never keep fish with your shrimp, you just have to be careful and choose wisely. Otocinclus – For small planted tanks, otos are one of the most popular choices out there for a number of reasons. They stay small, are very peaceful, and do a great job of helping control the algae in your aquarium. Small Tetras – Small tetra species are another common choice for pairing with dwarf shrimp. Cardinal Tetras (Paracheirodon axelrodi) are, like otos, a common choice to pair with shrimp in a planted tank. Microrasboras – The emerald rasbora (Microrasbora erythromicon) can be a good choice as can the Celestial Pearl Danio (Danio margaritatus, formerly considered a Microrasbora species). Pencilfish – Nannostomus sp. pencilfish are another small option that can often be added with shrimp. Pygmy Cories – The pygmy cory cats (C. habrosus, C. hastatus, and C. pygmaeus) are all small enough to pose little threat to shrimp, though there may be some territorial squabbles from both staying near the bottom of the tank.